Christine and Rob were looking for unique Postcard Save the Dates for their upcoming destination wedding in Aruba so I created this fun design using one of their gorgeous pictures on the front. which I incorporated into the area on the right hand side of the postcard where the address usually goes. The postcard save the dates were supplied with envelopes so although they are designed to look like postcards I would always recommend they are sent in envelopes (for safety and to ensure the invite/save the date isn't damaged during mailing). I also included a fake Aruban stamp and a postmark which included their names and wedding date. 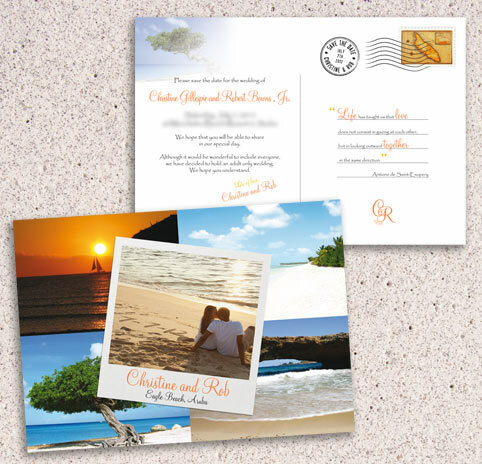 Christine chose to include an image of a Divi tree which is an iconic Aruban tree as a watermark in the top left hand corner as well as one on the front of the Postcard. If you're considering a Postcard invitation or Save the Date all the images, colours, text and layout can be customised to suit you so just let me know what you have in mind by contacting me here. "It was a wonderful experience working with Kate! She designed our postcard save the dates for our wedding in Aruba, and we love them! I did a lot of research online for unique ideas for save the dates and invitations, and I kept coming back to this site. I've been working with vendors in Aruba for the wedding, and it can be frustrating at times because they are not always prompt in getting back to you - they work on "island" time. So I was nervous working with another vendor overseas. Kate, however, was involved in the entire process, from beginning to end, like she was next to me the entire time. It's a great feeling to be at ease while someone is working on something very important to you. Words can't express how happy we are with the final product! Kate is extremely talented, as well as professional and customer service focused. I can't wait to work with her again for our passport invitations next year! If you're still trying to decide on who should create your save the dates or invitations, look no further! You will not be disappointed with Kate and her work! It's always so nice to hear that people have found the process of ordering and working on their stationery with me straightforward. It's my aim to make the whole experience easy, fun and above all exactly the finished result you're looking for. I know how complicated planning a wedding, especially one abroad can be after I organised my own wedding in Maui entirely over the internet in 2003. I'm glad to hear Christine and Rob can recommend me and I'm really looking forward to working with them again on their Wedding Passport Invitations. If you'd like to see more examples of postcard invitations please click on the Postcards section here. If you'd also like to read some more Testimonials please click here.